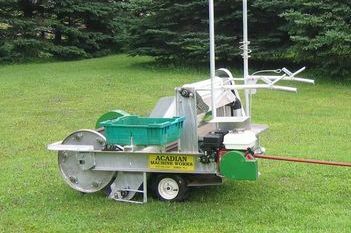 At last a blueberry harvester that does not require a tractor. 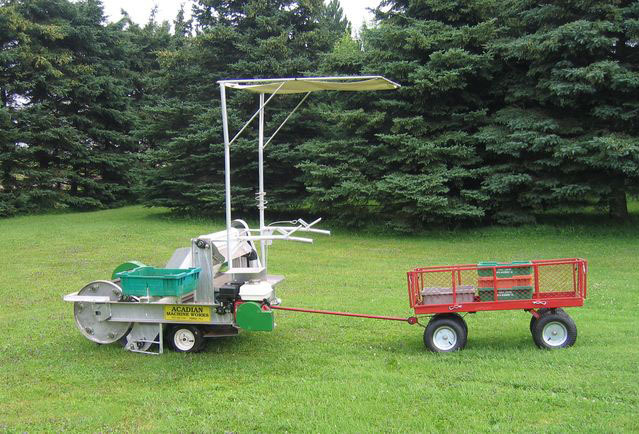 This self-propelled, walk-behind 5.5 horsepower harvester can harvest anywhere from one -2 acres per day depending on crop concentration and is ideal for the small to mid-sized farm. 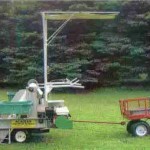 It is extremely maneuverable and is excellent for harvesting along the tree or fence line. Having a multi-speed transmission allows the operator to harvest in several speeds depending on crop concentration. Also having these multiple speeds allows the operator to travel from one location to another at a greater speed. The reverse gear allows the operator to be more versatile with the harvester like harvesting up to a stump then back away. This machine is user-friendly and requires only a minimum of training. The harvester fits into a half-ton truck so no trailer is required. It has been designed to be low maintenance and the replacement parts are available at most hardware stores.